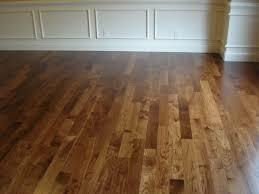 You have just moved in to a new home with hardwood floors or perhaps just installed a new hardwood floor. You are still recovering from the invoice and paying for this floor that makes you home look great and even increases the value of the home. Now is the time to decide that you are going to protect this investment and make sure that it stays looking great for a long time! All it takes is a few simple steps to maintain your floor, protect your investment and keep your home looking great for many years. Do not use Murphy’s Oil Soap. Murphy’s oil works great on wooden furniture, but don’t make the mistake of using it on your hardwood floors. Your floors should already be sealed and varithaned. Adding Murphy’s oil will not enhance the already great look your floor has. You won’t notice anything wrong after applying it once, but if used consistently, residue will build up and leave your floor with a dull appearance. Do not use a Wet Swiffer. A Dry Swiffer is great for collecting dust, dirt, and pet hair from your floors, and it is also less abrasive than a traditional tub vacuum cleaner. Central vacuum are better in that you can vacuum with a head that is suitable for hardwood floors. However, a Wet Swiffer can cause major long-term damage. The chemicals in the cleaning solution can break down the urethane finish on your floor and leave it dull, faded, and lifeless. A full sanding and re-coating of your floor will be required to bring back its original luster. Place area rugs anywhere that are high traffic areas. Prime high traffic areas are in front of the refrigerator, by the dishwasher, and near any sinks. Also hallways, in front of the couch and on the stairs are all high traffic areas. Make sure that the floor is protected in any spot that is susceptible to minor leaks and water spills. A small pool of water can quickly destroy your floor. Use floor mats at entrance locations. These are spots where people step on the hardwood directly after being outside. In addition to protecting against wet or muddy footprints, floor mats will help collect any sharp or abrasive materials stuck in the treads of shoes. Add a shoe mat if there is moisture on your shoes as well to collect any water and grit that may be dragged in with your shoes. This step will help prevent accidental scraping or scratching of the hardwood. Use felt pads when moving furniture. Always lift the furniture off the ground to move it instead of sliding it across your hardwood floor. If the furniture is too heavy and you must use felt pads make sure that they are free of any debris that could scratch the floor. The smallest stones or pieces of grit can scratch and gauge your floor leaving a lasting mark. If you know of other approaches to protecting your floors please leave us a comment. We assume that everyone removes their shoes before entering their home, however not everyone subscribes to this habit. Each time you enter your home you track in small particles of grit that will act as sandpaper on your floor each time you walk across it. This will quickly scratch your floors and remove the shine from them. If you insist on wearing your shoes, vacuum often. You should vacuum often to protect your floors especially near entrance areas and high traffic areas. You might even put down area rugs to protect your floors even further.